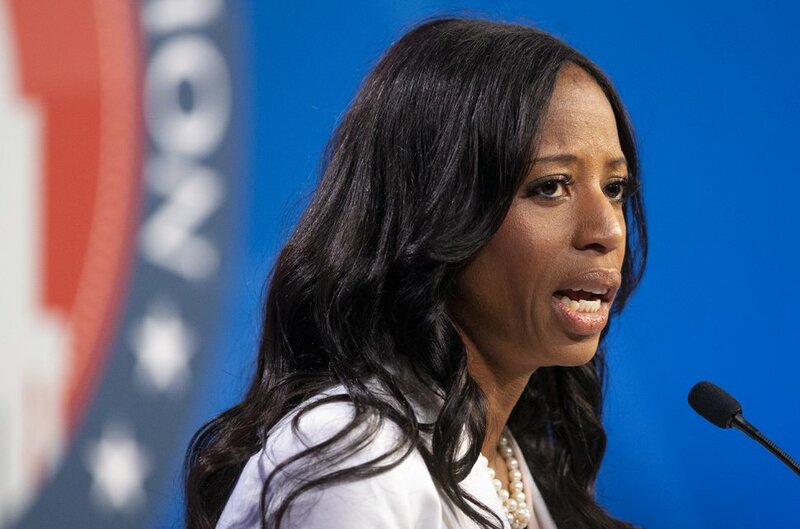 High on the list of groups making outside “independent expenditures” to help re-elect Rep. Mia Love, R-Utah, is something unusual: the Virgin Islands Republican Party reports spending $204,000 to support her this election cycle. Why would a group in the faraway Caribbean U.S. territory spend so much to help Love in Utah? “It’s a scam,” says Dave Hansen, Love’s campaign manager, an assessment shared by watchdog groups and reporting by some newspapers nationally. The thousands that the group reports spending on Love’s behalf went mostly for consultants who send letters to raise more money, disclosure forms show. (Scott G Winterton | Deseret News, pool photo) Congresswoman Mia Love answers a question as she and Salt Lake County mayor Ben McAdams take part in a debate at the Gail Miller Conference Center at Salt Lake Community College in Sandy as the two battle for Utah's 4th Congressional District on Monday, Oct. 15, 2018. "Some have called the Virgin Islands Republican Party a ‘scam PAC,’” says Brendan Fischer, director of the federal reform project of Campaign Legal Center, a watchdog group in Washington, D.C. While the committee is indeed operated by the Republican Party in the island territory, he notes it is not registered as a party arm but as a nonparty political action committee (PAC). “The markers of a scam PAC are when a committee raises a lot of money from small-money donors with promises the funds will be used to support candidates or causes, and instead the money is used to support the PAC,” Fischer said. Disclosure forms filed with the Federal Election Commission show that the Virgin Islands Republican Party raised about $2 million this election cycle — and about two-thirds of it came from small donors who gave less than $200, so their names are not disclosed. The committee donated only $5,000 to one candidate — which happened to be Love. The treasurer of the Virgin Islands Republican Party, Scott Mackenzie, does not live in the islands. He lives in the Virginia suburbs of Washington and helps operate several other conservative PACs. One of them, Conservative StrikeForce, lost a court fight in 2015 after Ken Cuccinelli, a failed GOP gubernatorial candidate in Virginia, accused it of wrongly using his name to raise money. In a settlement, the PAC agreed to pay $85,000 and turn over donor lists. None of those older Utah donors wanted to speak on the record. One said she does not remember donating to the group. The caretaker for a 98-year-old said that woman had been donating most of her savings to solicitors until the family stopped it recently — but she had no direct knowledge of the woman giving to the VIGOP. One donor had died since his last contribution. The San Antonio Express-News found in 2016 that several older Texans had also been targeted then by the Virgin Islands Republican Party with solicitations purporting to help Rep. Will Hurd of Texas, one of three black Republicans then in Congress (along with Love and Sen. Tim Scott, R-S.C.). The chairman of the Virgin Islands Republican Party is John Canegata. He did not respond to Salt Lake Tribune questions about whether his group is a “scam PAC,” nor requests to explain more about its ads and operations. He did say in an email why his group reports spending on behalf of Love. News stories nationally have explored controversy involving the Virgin Islands Republican Party. Politico earlier this year reported that Canegata suggested that his group’s “behind the scenes” relationship with and donations to Interior Secretary Ryan Zinke improved federal response to hurricane damage in his island. The Campaign Legal Center has also filed a complaint with the FEC contending that news stories said the Virgin Islands Republican Party had a 2017 fundraiser — in which attendees paid thousands of dollars to have their picture taken with Zinke — but said the group never disclosed who those donors are. The Source, a news site in the Virgin Islands, reported this year that the GOP in the islands earlier had split in a raucous fight — with the faction headed by Canegata winning but being accused of running a scam PAC. The New York Times in 2014 reported how money raised by the VIGOP went mostly to raise more money, and ended up in a bank in Virginia. It noted the PAC spent little in the Virgin Islands but donated to some other Republicans nationally. The party also received attention when it elected nonresidents of the islands, including a political consultant from Michigan, as its delegates to the Republican National Convention in 2016 to help nominate President Donald Trump.